The Japanese import store Umami Mart finally opens its long-awaited beer and sake bottle system. 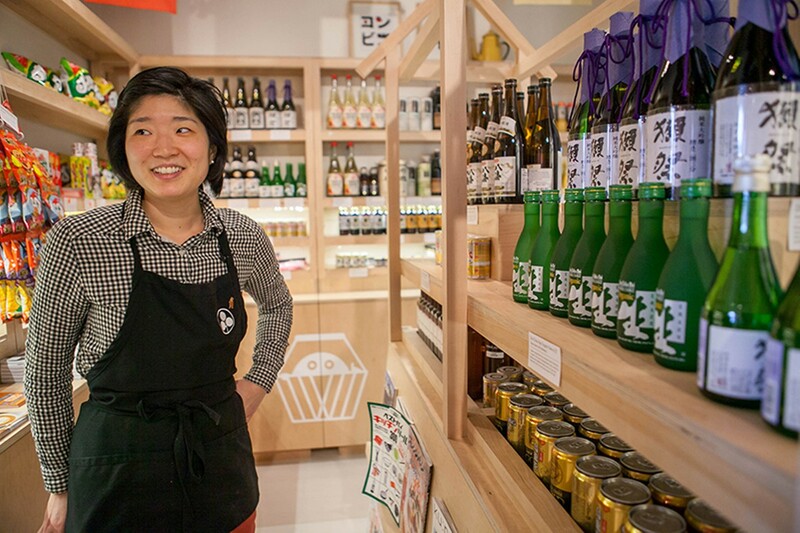 Umami Mart's Yoko Kumano can tell you anything you want to know about sake. Umami Mart was a long shot from the beginning. 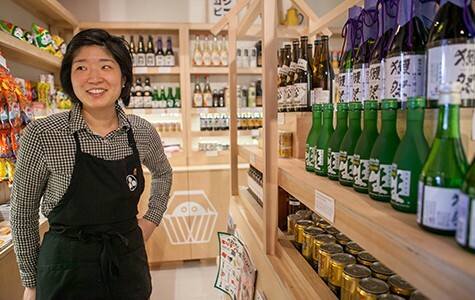 Co-owners Kayoko Akabori and Yoko Kumano never expected their foodie-centric specialty Japanese import store in downtown Oakland to be wildly popular. Even Akabori herself admitted that the store is "really, really, really niche." But after years of developing their finely curated brand, the duo's particular tastes have proven to be their best asset. Now, after finally procuring the proper permits, the store at 815 Broadway has also opened its Bottle Shop section, which boasts the biggest stateside selection of Japanese beers that the pair is aware of — with a wide selection of sakes to boot. Back in 2007, Umami Mart was merely a blog. Akabori was living in Tokyo, Japan and Kumano was living in New York City, when the friends decided a blog would be the best way to mutually geek out over the food and drink that their respective cities had to offer. Within a few months, the blog expanded to ten authors, all of whom were similarly passionate about Japanese dishes and drinks, and the exquisitely designed tools that are best for making them. By 2012, Kumano and Akabori reunited in Berkeley. Kumano was working at a sake tasting room, while Akabori was tending bar at Camino. Instead of retiring the blog (which had gained an online store), they dreamed of turning it into their livelihood. That's when they heard that a small business incubator called Popuphood was offering six months of free rent for a vacant storefront in Old Oakland. With the dream of a brick-and-mortar shop where they could offer the Japanese alcohols they raved about it in writing, they decided to take the leap. Umami Mart opened in August of 2012, but licensing obstacles prevented Kumano and Akabori's alcohol-slinging dreams from becoming an immediate reality. So in the meantime, they settled on offering an impeccably tasteful selection of imported Japanese bar and kitchenware, as well as a "conbini" (the Japanese word for convenience store) section, which offers Japanese snacks. As of mid-February, however, the Bottle Shop is officially open, and it was clearly worth the wait. Kumano, who is a certified sake specialist, curates the sake selection like a matchmaker. The offerings include beverages such as Sho Chiku Bai Organic Nama ($7), a Berkeley-made organic sake with undertones of banana and vanilla, and Dassai 23 Dai Ginjo ($95), an imported sake made from highly polished rice with a bright, bouquet fragrance and a long finish. They currently carry roughly ten sakes, but will be expanding to up to thirty in the next few weeks. Rather than quantity, they want to focus on quality and range, because choosing from a huge selection of sakes can be overwhelming. "It's very intimidating to buy sake because there are no clues on the bottle. And in general I think that sakes are so versatile," said Kumano. "So if we can bring a little sake knowledge to the community, then that's pretty exciting." Kumano and Akabori aim to offer an educational shopping experience, in the vein of the Umami Mart blog. Before stocking any product, the store's entire team sits down for a tasting. When you ask any one of them about a particular sake, they can tell you anything you want to know, including what types of food it pairs best with, where it was brewed, and what qualities make it special. In comparison to sake, Japanese craft beers are much more difficult to get your hands on in America. Small batch brewing has only been legal in Japan since 1996, so while there are many microbreweries, they haven't reached the same popularity as their American counterparts. Kumano and Akabori made it a goal to carry every Japanese craft beer that they could buy. They currently offer around 25, but intend to increase that to fifty by late April. As far as they've heard, they already carry the largest selection of Japanese beers in America. The beer selection includes the Iwate Oyster Stout from Sekinoichi Brewery, which is brewed with fermented oyster shells to create a full, umami flavor, and Kirin Free, an example of Japan's uniquely high-quality non-alcoholic beers. They also carry eleven different Hitachino beers­­ — from the popular Red Rice to the more rare XH Shochu Cask Aged, which Akabori described as having an almost soy sauce-like savoriness. The pair said they love Japanese beer for the same reason that they love most products that are made in Japan: The quality is top-notch. Akabori added that there is a fascinating meticulousness behind the creation of many Japanese craft beers. Huge amounts of research go into perfecting ways to emulate different types of beers from around the world, then coming up with ways to make it even better, or sneak in a Japanese twist. Even though microbrewing is relatively new to Japan, many of the best craft brewers are also sake breweries who have been around for generations (like the two-hundred-year-old brewery that makes Hitachino beers).